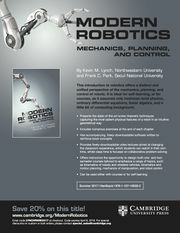 This is the home page of the textbook "Modern Robotics: Mechanics, Planning, and Control," Kevin M. Lynch and Frank C. Park, Cambridge University Press, 2017, ISBN 9781107156302. This page is under construction. The Cambridge University Press book jacket. This book is the result of course notes developed over many years for the course M2794.0027 Introduction to Robotics at Seoul National University and ME 449 Robotic Manipulation at Northwestern University. The evolving course notes have been posted on the internet for years to support these classes. The date of the compilation of the book is noted on the front page. The current, and final preprint, version of the book is dated November 2016. We posted a "beta" version of the book in early October 2016; that version should no longer be used. Since the October version we have implemented a number of corrections, clarifications, minor restructuring, and expanded coverage of certain topics. We also gratefully acknowledge the forewords provided by Roger Brockett and Matt Mason. We are posting four versions of the book. All versions have exactly the same contents and pagination. They differ only in the sizes of the margins and the size of the print, as manipulated after latex'ing in Adobe Acrobat. Two of the versions have working hyperlinks for navigating the book on your computer or tablet. These files have been compressed to about 7 MB. Let us know if you have any problems reading them. Please note that recent versions of the default Mac OS X pdf reader, Preview, is known to have some bugs displaying certain images in pdf files. If a figure is not appearing properly, please try a better pdf viewer, like Acrobat Reader. The origin of the software is student solutions to homework exercises. In September 2016, Northwestern MS student Mikhail Todes produced the first version of the software for distribution. The software will be updated as bugs are discovered and fixed. As of October 2016, the software distribution should be considered a beta version. A major revision will be coming in January 2017. 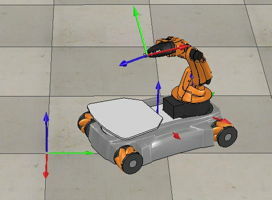 You might also be interested in Peter Corke's excellent Robotics Toolbox for MATLAB and other robotics software linked to from his site. Sometime early in 2017, more videos supporting the book will be posted to YouTube and linked to from this wiki. The videos will be made with Northwestern's Lightboard. If you are interested to learn more about what these videos might look like, you can check out the mechatronics videos at http://nu32.org.